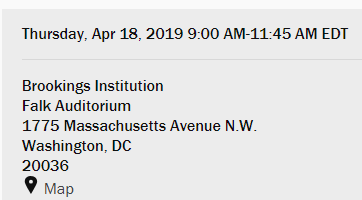 On Thursday, April 18, the Retirement Security Project at Brookings (Washington, DC) will host an event to explore ways to create lifetime income for people with 401k type plans. Join Nobel laureate Richard Thaler, Moshe Milevsky, and several other noted experts as they discuss new Brookings research. Running out of money in retirement is one of Americans’ greatest financial fears. Converting retirement saving balances into reliable income is one of the most complex financial decisions people must make. Most 401k and similar plans are not structured to provide lifetime income. Can retirement plans be reformed to provide safe income for the duration of retirees’ lives? You can also signup for the webcast on the signup sheet. This is a free event. You simply have to register. There is, I believe, a parking garage across Mass Ave from Brookings. In finance risk is defined as uncertainty that is consequential (nontrivial). | The two main methods of dealing with financial risk are the matching of assets to goals & diversifying. Signed up for the webcast - Looking forward to the webcast. I’m signed up for the webcast as well, but may not be able to listen to all segments. Members of labor unions have pensions based on annual hours worked, from contributions made by their employers. Other than the funding source and the pension manager, isn't that fairly similar to 401k plans with your personal contributions, then you buying an annuity at retirement? Every 401k plan has a brokerage providing access to the stock market, so just add access to an insurance company selling an annuity based on the employee's payments toward it, either periodic ones and/or a large single one at retirement. The insurance industry will be highly motivated to assist in helping to make the regulatory changes necessary for implementing the above. Isn't the problem that when the industry works to provide a solution, the solution is worse than the problem? What I mean is, they may come up with a way to provide an income stream but if it is expensive the cure will be worse than the disease. Of course, the insurance industry will be highly motivated to take your money. The problem is the individual lacks the buying power of a group pension plan. So sure, you can take your 401k and buy an annuity but don’t expect yourself to earn a fair and equitable rate of return. The insurance industry is not your white knight. One of the speakers on the second panel concerning life annuities is the CEO of Income Solutions, Kelli Hueler. Income Solutions is the annuity platform that Vanguard works with when Vanguard clients purchase life annuities through the Vanguard website. So that panel discussion should be of particular interest to Vanguard investors. A couple of things that I noticed when listening. 1. Although I am not at the RMD age yet - a couple of speakers talked about needed RMD reform due to their onerous processes. I have never heard a great uproar about this problem - could the rmd'ers out their comment on how bad the process is? One suggestion was eliminating the RMD on low balance accounts - those people are more likely need to spend the account down and not use it as an estate planning tool so that makes sense. With low balance proceeds and social security, sounds like a majority of people wouldn't be foregoing much taxes anyway. 2. With today's young employees & gig workers mobility - seems like a lot of the discussion was focused on employers as a principal player in adminstrating these plans (and lots of safe harbor discussion) - I would think things need to be highly portable going forward. Perhaps a decoupling of retirement savings, health care and life insurance away from employment coupling to individual responsibility? Just felt like this discussion was aimed at people in the current generation of soon to retire vs solutions for people that have 40 years of work/savings ahead of them. The videos and slides for the program are now available on the following Brookings page. Thanks for posting this, I did attend this morning. It's an interesting challenge and I found it very informative. I wonder if the new acronym GLIP will catch on - I think the speaker made it up on the fly. Last edited by Jazzysoon on Fri Apr 19, 2019 7:53 am, edited 1 time in total. I'm confused about your comments concerning RMDs. These are required *minimum* amounts, not maximum amounts. So if someone wants/needs to "spend the account down", they can just do that, no problem. This signature is a placebo. You are in the control group. Overall, I thought it was a really good program. I enjoyed Richard Thaler, David John, and Moshe Milevsky's sessions the most. This may be a dumb question, but many of the presenters kept referring to "the paper"; to which I kept wondering - what paper? I don't see anything on the site, unless I'm just missing it. I have provided some of my notes and observations below. - Thaler's "pet idea" is to let people buy more Social Security benefits. During the Q&A, someone asked if this would lead to anti-selection but Thaler waved this off. I do think it's reasonable to assume that those who buy more SS would tend to be healthier and would lead to a degree of anti-selection, but I suppose you could price that in. - The government is the best entity to bear the risk of a calamitous increase in longevity. Thaler gave his recommendation to students on how to get rich quick: open a reinsurance business in the Caribean, take in premiums until a big earthquake hits, and then fly to your island to live off the money. The analagoy is that this is what would happen to private sector insurers offering annuities if there is a big increase in longevity. Moshe Milevsky later, indirectly, provided the best rebuttal to this whole stream of thinking - life insurers sell annuities and life insurance, and these risks counterbalance one another. - Reverse mortgages: terrible name...who wants a mortgage, let alone a reverse mortgage. Nevertheless, we need to figure out a better way to help people use home equity to fund retirement. - Mental accounting matters. Thank you! Mental accounting is thrown around here as a pejorative, but I've always thought it can be useful if it leads to the accomplishment of a goal. - We need an auto retirement income solution. All countries are currently dealing with the issue of how to convert savings into income. - I would personally put an annuity or some form liability matching strategy as #1, followed by the managed payout fund and the emergency fund. - Tontines: watch the video, I cannot explain it here sufficiently. - Good data showing individuals in Canada who purchase a SPIA often purchase (1) an annuity with a cash refund or installment feature and (2) no COLA (CPI or otherwise). So, while economists and actuaries appreciate the opportunity to purchase longevity and inflation insurance, the average person has little interest, as evidenced by purchasing patterns. - T Rowe Price has a Managed Payout Fund coming out soon that will pay 5% of the average balance over the last 60 months. Only available within DC plans administered by TRP. I didn't catch much of his presentation. Discussed DC plan annuity purchase safe harbors and RMD rules (previously mentioned in this thread). - i.e., not much data going to the "good guys"
Bill Gale mentioned at one point that the paper he is co-authoring with David John and others tentatively titled, From Saving to Spending: Annuities and Nontraditional Retirement Payouts from Retirement Plans, has not been published yet. They originally were going to have a preliminary version ready for this program, but they decided to wait in releasing the preliminary version until after they had feedback from David John's presentation today. I thing the issue was government preventing large balance accounts used as estate planning vehicles. Certainly there are risks in the private sector, but let's be honest here. Governments are not known for always being honest, virtuous, altruistic entities that never change the rules of the game. Even right now, consider the uncertainty surrounding Social Security benefits starting at about 2032 and going forward. Exactly. Similar to many financial planners, their main drive is to separate as much of your savings as possible into their own accounts. No planet, no business. Earth bats last.